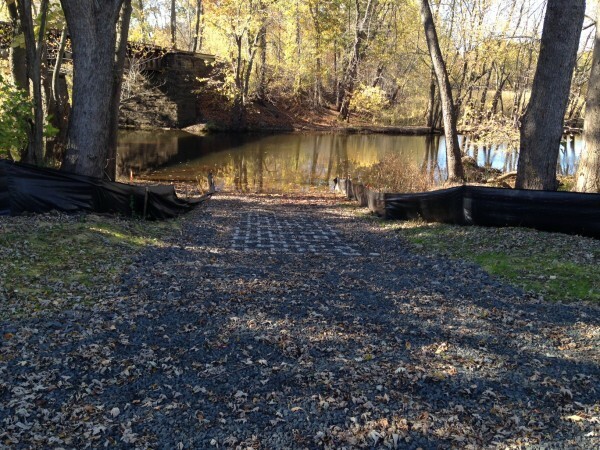 At Last — Canoe and Kayak Launch Completed! The Jonah Center’s earliest and longest-lasting project has born fruit. After 9 years of planning, proposal writing, grant writing, negotiations with City officials, set-backs, objections, more site-seeking, and much waiting, the Phil Salafia Boat Launch on the Coginchaug River is now finished. At least, the critical part — the ramp — has been constructed. It is made of interlocking cement pavers, held together with steel cables, and laid on 18″ of gravel. Even at the current extremely low water level, the ramp extends well into the water to form a solid bottom for people launching their boats. We anticipate a ribbon-cutting ceremony to be announced soon by the Mayor. We wish to thank everyone who played a part in this community-wide success – the Coginchaug River Access Group, City officials, and Jonah Center supporters who have kept the effort going over the years. We will continue to advocate for Middletown’s natural environment and our collective quality of life. The boat launch is named after Phil Salafia, a Common Council member in the 1950s who was a member of the first Parks Commission. The City purchased the “Salafia property” — 20 acres along the Coginchaug River just upstream from the new boat launch — from the family of Phil Salafia, Jr. in 2007. Facilitating this open space acquisition was one of the very first accomplishments of the Jonah Center.